Thanks to the cooperative efforts of ARS, USAID, and USDA’s Farm Service Agency, the children of Haiti may soon benefit from an instant corn-soy blend food aid developed by an ARS scientist at Wyndmoor, Pennsylvania. We’ve all seen the images on television from disasters overseas: Large white sacks of meal are unloaded from trucks as hungry families line up and await rations. The U.S. flag and the words “Gift of the United States of America” are prominently displayed in bright red and blue ink. These humanitarian efforts are the result of collaborations involving multiple national and international government managers, aid agency officials, and policy administrators. Agricultural Research Service scientists have been working with collaborators to bring enhanced features to food rations—corn-soy blends that supplement meals, particularly for young children. A new, fully cooked food-aid product has been developed as a result of this team effort. The work was led by food technologist Charles Onwulata in the Dairy Processing and Products Research Unit at the ARS Eastern Regional Research Center (ERRC), in Wyndmoor, Pennsylvania. 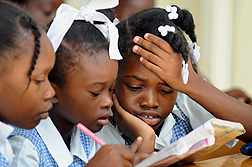 The U.S. Department of Agriculture’s Foreign Agricultural Service (FAS) administers the McGovern-Dole International Food for Education and Child Nutrition Program, which provides U.S. agricultural products for school feeding and other projects in more than 30 countries. The U.S. Agency for International Development (USAID)—an independent federal agency—works in 100 developing countries to distribute commodity staples to people at risk of hunger and malnutrition. USDA’s Washington, D.C.-based Farm Service Agency (FSA) purchases U.S. commodities that help foreign countries under the Agricultural Trade Development Assistance Act of 1954—or Public Law 480. This law was renamed the “Food for Peace Act” in 2008. 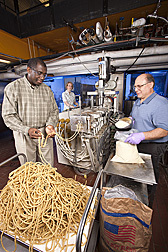 Food technologist Charles Onwulata (left) inspects extruded instant corn-soy blend before milling and packaging while engineering technician Eric Tilman (right) scoops up a corn-soy blend intended for extrusion. In the background, chemist Audrey Thomas-Gahring monitors the control console. The FSA implements agricultural policies and oversees the procurement chain for multiple programs. These include purchasing U.S. commodity products using both FAS and USAID funds. These commodity foods are then provided to FAS programs and USAID Food for Peace programs, which direct the foods to recipients through a wide network of partners that includes the United Nations World Food Program. A nutritionally fortified and processed corn-soy blend is provided as a supplement to a ration that provides staple foods. This ration has been supplied as uncooked or partially cooked fortified corn- or wheat-soy blends that contain oil, vitamins, and minerals. But as with most food products, such blends go stale over time. Spoilage problems have been associated with uncooked corn-soy blends when fat components—oils—in the mix go rancid. Fine particles in the blends can segregate and fall to the bottom, and key vitamins and minerals can settle as well, making the mixture less nutritious and effective for the already malnourished. These uncooked and partially cooked formulations were developed by ARS scientists nearly 50 years ago. During the past 15 years, Onwulata has worked on improving food blends and has now produced an enhanced ration that comes as a fully cooked commodity product. “The new product is called ‘instant corn-soy blend,’ or ICSB, and it can be stirred with sanitized, potable drinking water” to make the ration, says Onwulata. Periodically, FSA’s Kansas City Commodity Office in Missouri issues invitations for bids requesting particular commodities for procurement, as well as the requirements involved. The new ICSB could now be one of those commodities. FSA included the new extruded process that ARS developed into the specifications for an additional type of corn-soy blend. ICSB could be purchased for the FAS-administered McGovern-Dole program. Instant corn-soy blend (ICSB) is fully cooked. ICSB shown here is extruded, ground into a powder, and mixed with tepid water, producing a porridge. Onwulata then began developing a new food product using the same type of machines that are used to make puffed snacks and cereals. “Cheese puffs” and “cereal puffs” for example have been popular in the United States for more than 50 years. ICSB looks much like these popular puffed snacks when they exit the machinery—before it is ground—but with a creamy color and harder texture in its dry form. The technology developed is referred to as an “instantized” process, which cooks foodstuff completely in a short time, under high heat and high pressure. The machine used to produce the food product is called a “twin-screw extruder.” Cooking extruders are specialized food-manufacturing machines consisting of tightly fitting screws that rotate within a stationary barrel. The uncooked corn-soy meal, the vitamin premix, and the mineral premix enter the barrel at one end and are heated and mixed by a variety of mixing and mashing screws. The cooked product then exits the extruder through an opening at the other end of the machine—and in less than 2 minutes has taken a new, fully cooked, expanded and textured form. The textured corn-soy blend is then crushed and milled to size to form the ICSB. 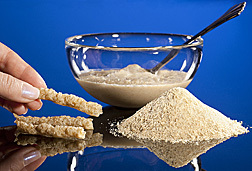 Onwulata conducted several experiments showing that twin-screw extrusion could be used to create an instant product that, when rehydrated with safe drinking water, turns into a porridge that meets all required nutritional specifications, color, and consistency. The extrusion-based product that Onwulata and his team developed is based on the same formulation as traditional corn-soy blend, with the advantages being that the nutrients and oils are fully integrated into it. “This addresses the initial concerns of off-flavors, off-colors, and uneven nutrient distribution in corn-soy blend,” says Onwulata. On the road to ICSB success, Onwulata published a study in which he evaluated the composition, vitamins and minerals, and other properties of corn-soy blends made by six processors. His findings showed nonuniform distribution of the added vitamins and minerals. The paper, “Variation in Corn Soy Blends for Overseas Distribution,” which was coauthored with six other ERRC scientists, was published in Cereal Foods World in 1999. The findings also drove home the need to change to an instant, ready-to-eat blend. For the next 6 years, Onwulata worked on finalizing the new fully cooked, ready-to-eat product. In 2005, Talari V. Rao Jude—who at the time was a lead food scientist with FSA’s Commodity Policy Procurement Analysis Division—spotted the corn-soy blend evaluation paper and contacted Onwulata to review and discuss ICSB. “The merits were so overwhelming that we initiated a joint collaboration in 2008 between FSA and ARS to produce fresh ICSB product,” says Jude. Then in 2009, Jude contacted Food for Peace to discuss the merits of ICSB as an improved product for humanitarian feeding programs. This led to a key meeting in a series of in-person demonstrations of the new product. ARS attendees included ERRC’s Onwulata, technology transfer coordinator Robert Griesbach, and senior national program leader for utilization L. Frank Flora. Representatives of FAS, FSA, and USAID also attended, along with representatives from the private and manufacturing sectors. The group met in Washington, D.C. in June and November 2009. Onwulata and colleagues provided attendees a sample of the instant porridge made from ICSB mixed with water. “Other nutritious products made from ICSB were also served,” says Jude, “and all were liked by attendees.” Onwulata also provided nutritional fact sheets and a primer on industry’s capability to produce the product. Jude had been working since 2000 on food-quality issues associated with food-aid products. He analyzed spoilage data on a bagged, partially cooked corn-soy blend that had been transported to foreign countries as food aid. He then recognized that particle size variation caused poor distribution of minerals and that the new ICSB could solve the problem. A new, stable, fully cooked product would require a new manufacturing network. This meant that further demonstrations to educate potential manufacturers on mass-producing fully cooked, extruded rations were needed. “The demonstration to administrators in June 2009 opened the way for further demonstrations to potential manufacturers on how the new extruder equipment and processes are used to produce the new product,” says Jude. By 2009, development of a new formula and specifications for instant corn-soy blend had gained recognition among key food-aid sponsors. “This was accomplished in part through the continuing series of demonstrations that focused on policy officials, manufacturing managers, scientists, and aid-agency officials,” says Onwulata. “Nearly 5 years ago, Onwulata described a new fully cooked, extruded food-aid product he was developing that would overcome some of the problems we’d been experiencing with traditional corn-soy blends,” says Cleveland Marsh, FSA’s assistant to the deputy administrator for commodity operations and also acting export program manager. “In late 2010, we amended our Commodity Requirements Document, or CRD, to include specifications for producing ICSB as an option, in addition to producing traditional milled grain as an option.” Once a request for food aid that cites the new CRD is received, FSA is in a position to procure the most competitively priced products. ICSB was specified by FSA as a supplemental food for emergency rations, displaced-persons assistance, and as a weaning food in maternal and child health programs and other programs. It is to be composed of pre-gelatinized cornmeal; toasted soy flour; refined, deodorized, and bleached soybean oil; premixed minerals; and premixed vitamins and antioxidants. The finished-product requirements stipulate thateach 100-gram serving must have a uniform distribution of vitamins and minerals. The ICSB must also be manufactured so as to produce a fully cooked end product with a neutral to slightly nutty flavor and must have a light yellow to golden buff color. Particle size and nutritional labeling are also stipulated. For more than 15 years now, FSA has been consulting with ARS’s Onwulata on resolving problems associated with uncooked corn-soy blend. Onwulata has provided direction for FSA policy on Food for Peace programs and, working with ARS national program leaders, has consulted regularly with USAID and FAS on Title II emergency feeding programs. Food for Peace provides $2 billion worth of commodity-based meals each year in times of emergency. To ensure that USAID can provide the best products for the Food for Peace programs, Food for Peace initiated a 2-year review of the nutritional quality of food aid through a contract with Tufts University Friedman School of Nutrition and Policy in Boston, Massachusetts. A product similar to ICSB, but with a different formulation and micronutrient profile, may fulfill some of the recommendations of that review. In addition to reviewing existing products, Food for Peace has been working with other university experts and USDA to develop the next generation of food-aid commodities, such as ready-to-use meal replacements for emergencies and foods for supplementary and therapeutic feeding programs. It is expected that new products from both the Tufts review and the development of specifications for a variety of ready-to-use foods will be rolled out over the next 2 years.—By Rosalie Marion Bliss, Agricultural Research Service Information Staff. This research supports the USDA priorities of ensuring food safety, promoting international food security, and improving children’s nutrition and health and is part of Quality and Utilization of Agricultural Products, an ARS national program (#306) described at http://www.ars.usda.gov/research/programs.htm. Charles I. Onwulata is with the USDA-ARS Eastern Regional Research Center, 600 E. Mermaid Lane, Wyndmoor, PA 19038-8598; (215) 233-6497. "Fully Cooked Emergency Aid Food" was published in the August 2011 issue of Agricultural Research magazine.